We are located at the corner of Elphinstone St. and Dewdney Ave. 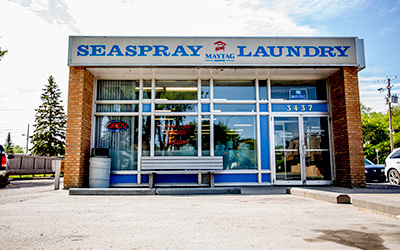 Established in 1994, Seaspray Laundry has been keeping Regina clean for over 20 years. 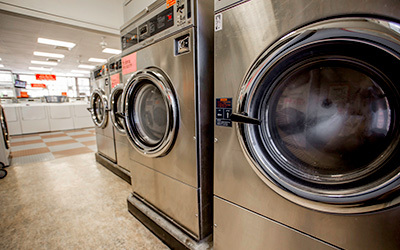 Our store has a fresh and friendly atmosphere with updated washing machines for both your residential as well as commercial needs. We are located conveniently at the corner of Elphinstone St. and Dewdney Ave. and are open seven days a week. Take care of your everyday laundry here at Seaspray Laundry. 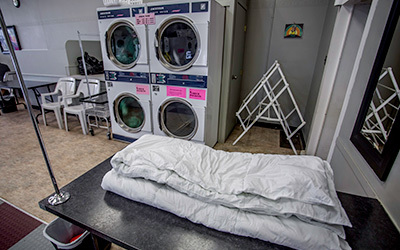 We have coin operated MAYTAG Equipment and an easy drop-off Service that includes a wash, dry and we fold it for you! We also can do any seasonal or specialty laundry needs you may have such as quilts, sleeping bags, and duvets! We even do Commercial Laundry! Save some cash with us and get a deal on washing Coveralls, Work Uniforms, and Rig Clothing.